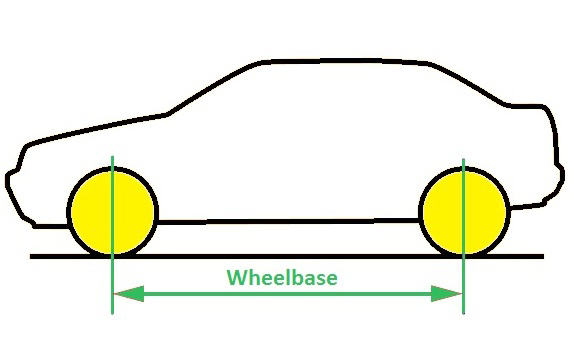 Wheelbase is the center distance between the front and the rear axle of the vehicle. It is one of the important dimensions of the vehicle that is specified by the vehicle manufacturers. This term is applicable to bicycles, two-wheelers, four-wheelers, trucks etc. i.e. for every vehicle type. Although the term wheelbase does not directly give the idea of the length of the vehicle; generally speaking the longer the wheel-base, the longer is the overall length of the vehicle. The main significance of wheel-base lies in the fact that it gives an indication of the dynamic characteristics of vehicle i.e. ride and handling. Along with the wheelbase, ground clearance also affects the handling of the vehicle. Vehicles with the longer wheel-base are believed to have better ride comfort than the vehicles with shorter wheel-base. This is mainly because such vehicles have a reduced tendency to pitch & roll compared to other vehicles. Also, long wheel-base allows the vehicle manufacturers to allocate a larger area for passenger compartment making the cabin even more spacious. On the other hand, shorter wheel-base vehicles are better in maneuvering turns at high speed. So, the wheel-base helps in riding comfort for the passengers on the long journies. The manufacturers prefer to design the vehicles with longer wheel-base to maximize the comfort for the passengers. Luxury cars such as the limousines have the maximum wheel-base than other types of cars. Some manufacturers specially manufacture the high-end cars with longer wheel-base to cater to some niche clients. Most luxury segment cars such as Mercedes Benz and BMW offer some specific car models with a longer wheelbase as an option. Home » Technical Anatomy » Wheelbase: How Important Is It In Designing The Vehicle?